Want to know what it’s like to drive a forestry transport truck? 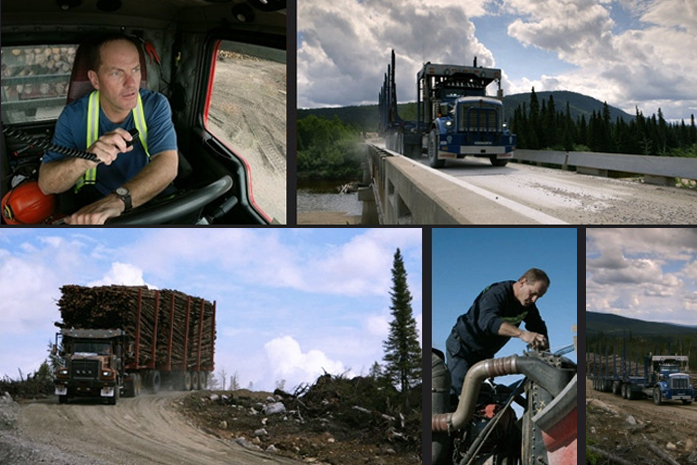 New TV documentary series explores the lives of forestry truckers – including one Resolute partner. Helming a tractor trailer heavily loaded with fresh-cut spruce across rough logging roads in the winter is not for the faint of heart. But it’s just another day for the men behind the wheels of the massive transport trucks that move timber from harvested areas to the sawmills of Quebec. Mastodontes is a Canal D documentary series (in French) that explores the lives and livelihoods of truckers specializing in forest transport. And it features one of our transport partners – Rejean Fortin – who works with Resolute in our Lac-Saint-Jean woodlands. If you’ve ever wondered what it would be like to charge headlong through the Quebec wilderness with several tons of timber in tow, watch the premiere of Mastodontes. The series starts October 21st and episodes re-run several times throughout the week. Here’s the complete schedule.